The Seascape Beach Resort in Aptos is truly unique in Santa Cruz county – and there’s not much else like it in the entire state of California. The resort is a CondoTel – each room or suite in the hotel is privately owned, but most of them are rented out to resort visitors when the owners are not using the units. In fact, owners of the units are restricted to a maximum of 90 days occupancy per year (so that the county can collect the transient occupancy tax on guests the rest of the time). Seascape Resort is one of the most popular venues for a wedding in Santa Cruz county, with hundreds (thousands?) of area couples having married here. It’s also a popular spot for corporate retreats, and many weekend you can find any number of groups from Silicon Valley companies inhabiting the resort. The resort also features one of the very few “private” stretches of beach in California. Several acres of sand in front of the resort is owned by the resort (and some neighboring properties). While alcohol is banned on all public beaches in Santa Cruz county (and that means, pretty much all beaches) – you are free to tipple on the Seascape Resort’s beach. The resort even arranges bonfire-and-s’mores fests for hotel guests, complete with golf cart rides down to the sand and back. You can’t beat it! 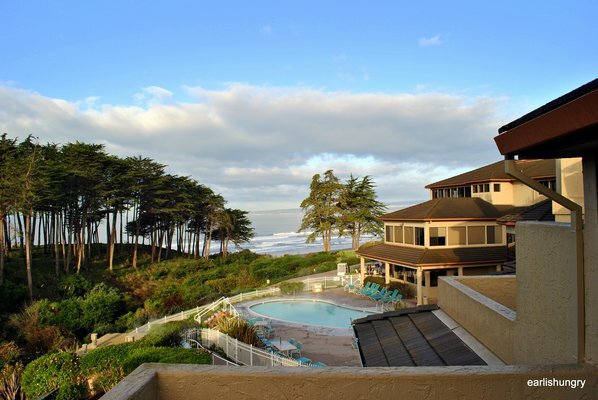 The Seascape Resort also features Sanderling’s Restaurant, which offers casual dining (and a full bar) with terrific sunset and whitewater ocean views.